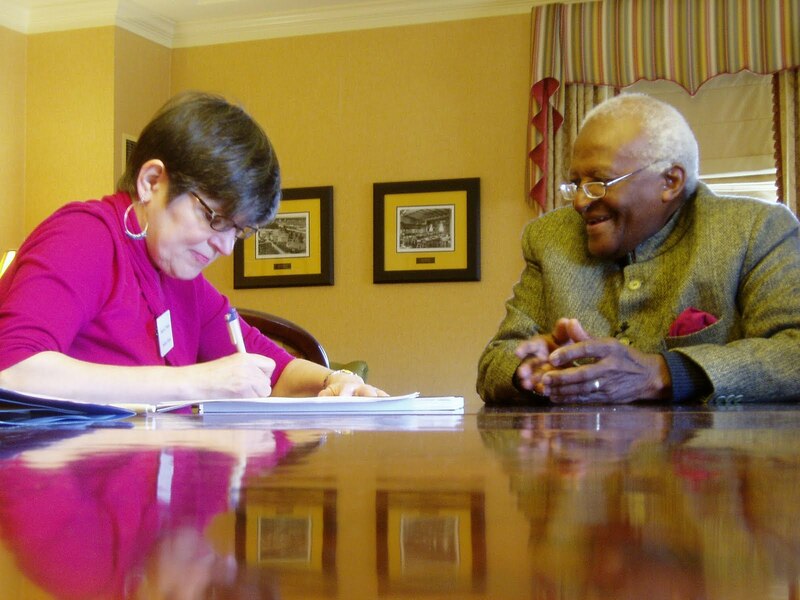 I recently had the privilege of interviewing Nobel Peace Prize winner Tutu. We talked about peace and reconciliation somewhat indirectly, as the subject was Tutu's forthcoming Children of God Storybook Bible, which will feature his favorite Bible stories and center on themes of reconciliation and forgiveness. But peace was certainly in the room. He has an infectious laugh and lots of personal warmth. I had read his brand new Made for Goodness, which answers the good question, " 'How do you keep your faith in people when you see so much injustice, oppression, and cruelty?' " The answer in the book takes more than 200 pages, so here is a summary that uses the bits I couldn't stick in the Bible story. He said: "This is a moral universe. This is a universe where right and wrong do matter. When you look at the evidence of history, (Stalin, Hitler, and their ilk) end up being part of the flotsam and jetsam. At home in the darkest hours, that what's we used to say: 'the apartheid government has already lost. ' It's not just whistling in the dark. There is a heck of a lot of evil around. Where the heck is God in all of this? Yes, God is there. ... Yes, people are good and in the end that good will remain." After spending only a brief time in his presence, I felt deeply encouraged. As much as his joy, his hope -- he doesn't consider himself an optimist, but does have hope -- is contagious. Cool! I reviewed Made for Goodness for Christian Century and was moved by the optimism of a man who has seen so much evil.